Firstly thank you so much for all of the lovely comments that I received on Part 2 of the series that shared my planning and a look at Mr B's budget friendly nursery. 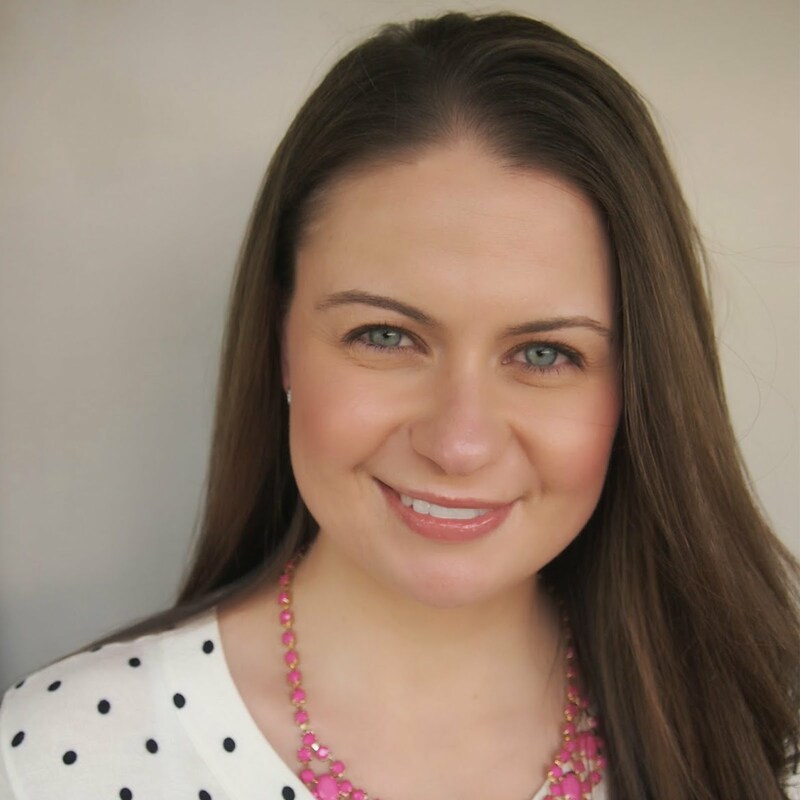 If you haven't checked out this post, I would love you to do so here. Part 3 of the Project Nursery series gives you a little sneak peak in to the organisational aspect of my nursery, and I truly hope to be able to provide you with some ideas, advice and inspiration for planning your own. If I could only give you one piece of advice for creating and setting up your nursery, it is that organising it is vital. Give everything a home and ensure that your nursery is set up for ease of use at all hours of the day (especially at 3am in the morning)! There is always something happening in the nursery- feeding, sleeping (if you are lucky), nappy changes, frequent changes of clothes and playtime. 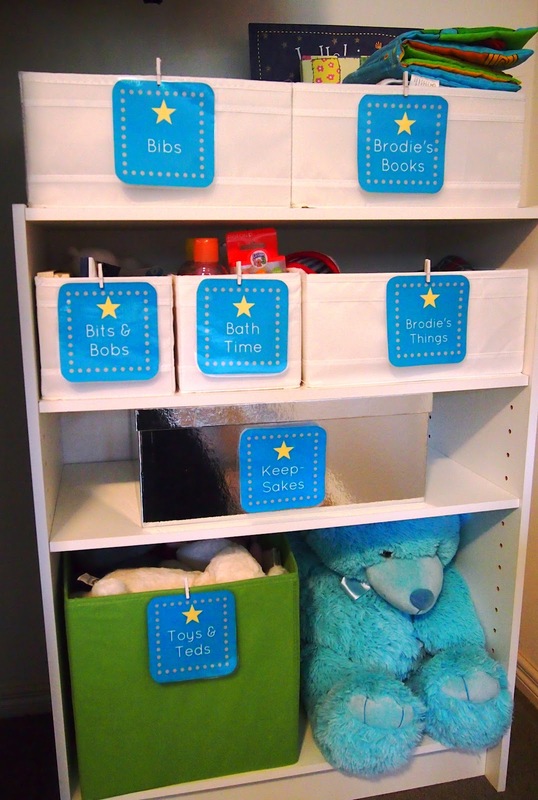 If you don't have organisation in place for all of the toys, clothes, nappies and baby products then your nursery can very quickly go from clean to utter chaos in a matter of seconds!! 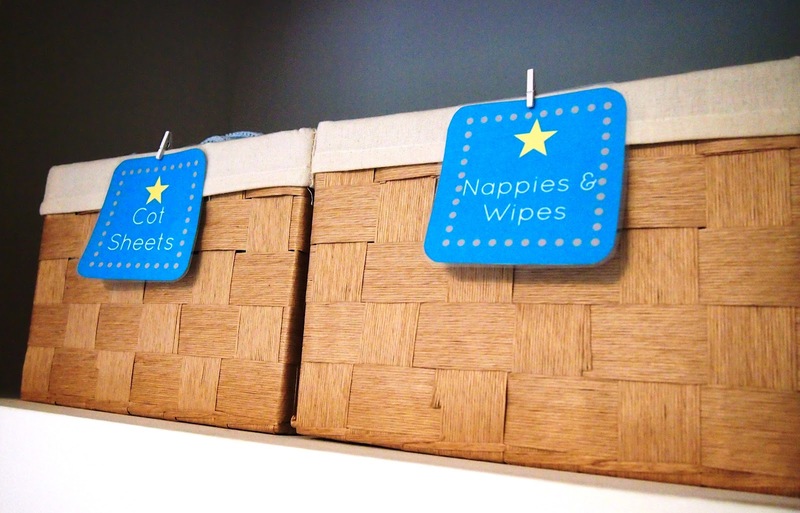 One of the most important areas to organise in the nursery is most definitely the 'nappy' station because as much as I hate to break it to you, this is where you will be spending a lot of your time!! You definitely don't want to be caught short in the nappy area, so put together an organised system that is easy for you to use and also to maintain. In my nursery we have a chest of drawers that doubles as a change table and it is fabulous. I find that with the separate change tables, quite often there is not enough room for a large nappy caddy to sit on the top of these units. This means that you are constantly bending down and trying to reach underneath for what you need. 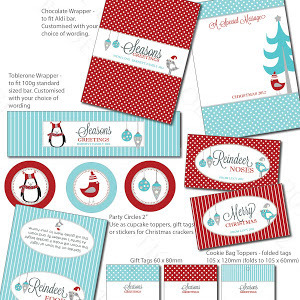 I personally love having everything organised and right there at your fingertips. The added bonus of the 'all in one' is that you save space in your nursery by just having the one unit. If you cannot find a suitable all in one, then consider looking around for a dresser you love (ebay is great! ), as you can purchase a change mat to affix on the top and simply remove when you are done. I highly recommend getting a large nappy caddy so that you can not only fit in your nappies, but also keep your other everyday essentials in it such as cotton balls, sorbelene cream, hand santiser, wipes and paw paw ointment (how good is this stuff?!). Keep the caddy close to the action - nappy action that is - because it is quite obviously very unsafe to leave bubs on the change table whilst you run to the bathroom to get cotton balls! My gorgeous little chevron caddy was made for me from a wonderful seller on Etsy. Are you a hanger? Or do you prefer things folded up neatly in drawers? 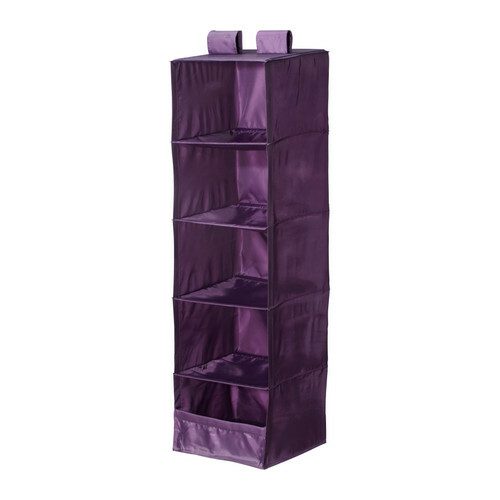 Find a style (or a mix of) that suits your space requirements and preference for organising clothes. As you can see from the above, I am personally a 'hanger'. I love opening the cupboard door and seeing everything hanging neatly in a row and organised in to sections. Some people like to organise by size or by colour but I like to order my nursery by type and then by size. My cupboard is organised in to the categories of sleeping bags (yes I hang these!) jumpsuits, short sleeve tops, long sleeve tops, jackets, shirts, coats and pants. I find that this system also allows my husband to easily find clothes when he takes charge. To keep things organised in 'sections' I love the idea of making your own 'section tags' that fit over your wardrobe rail so that you can see where each section starts and ends. 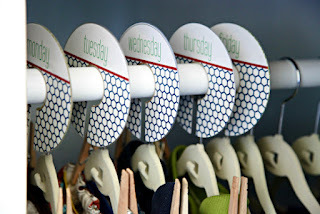 The very clever Jen from I heart Organizing has implemented this idea at her beautiful home, and used section tags for planning what her kids will wear for the week ahead. In a nursery, it would be brilliant to instead have customised tags to show clothing 'types'. I am eager to implement this idea in to my nursery, so if fellow readers are interested too, I would be happy to design a free template for you to use in your home. Let me know by comment if this might be of interest and I can run this little project down the track. 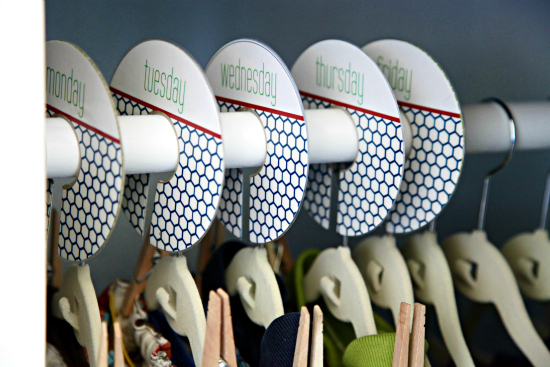 I confess to being a bit obsessive when it comes to my hangers - they must all match. 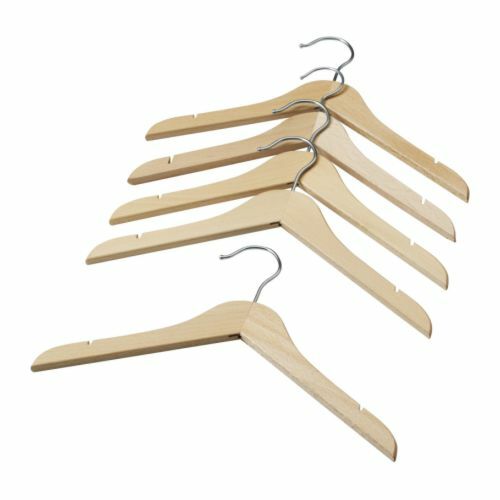 I have used the Ikea 'Hanga' Wooden kids hangers and they come highly recommended - check them out at your local Ikea store. Whilst not the cheapest option at $1 a hanger, they really are great quality and will last for many more years to come. When I was pregnant I started 'collecting' these every month so by the time Mr B arrived I had a wardrobe full and I bought them as I could afford. 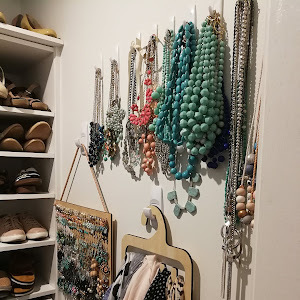 If you are short on space, but like the idea of having things hanging in the closet, you might consider a hanging organiser. 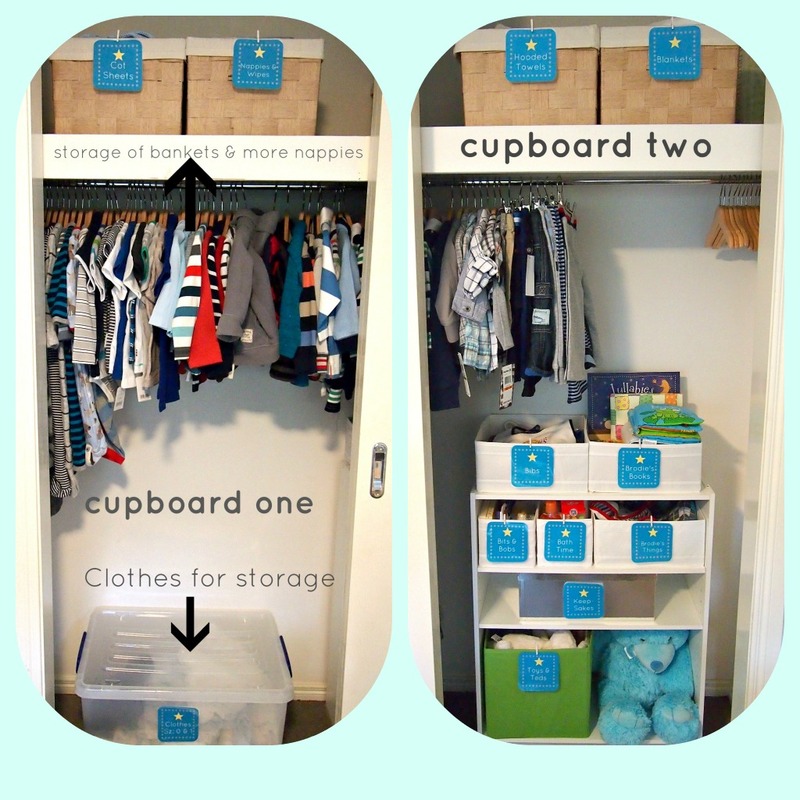 Babies clothes are teeny tiny so implementing something like the below Ikea Skubb organiser would give you oodles of vertical space if you are short on room. 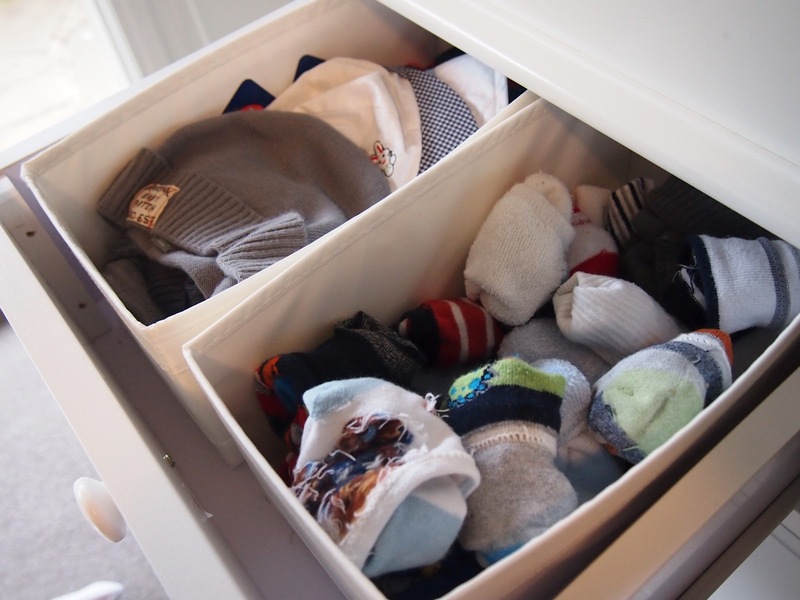 If you are choosing to fold most of your items in a chest of drawers, implement a system that makes sense. Put the items that you use most at the top - for us that is extra lotions and potions, socks and singlets. As you can see my lotions and potions are proudly displayed in the Mor-Stor Pippa Nursery set in 'white'. This set is just amazing and if you haven't entered the giveaway to win one for yourself, definitely do so now, and you can see just how fabulous it is for yourself. The rest of the drawers have Ikea Skubb organisers in place to sort out all of the little items. 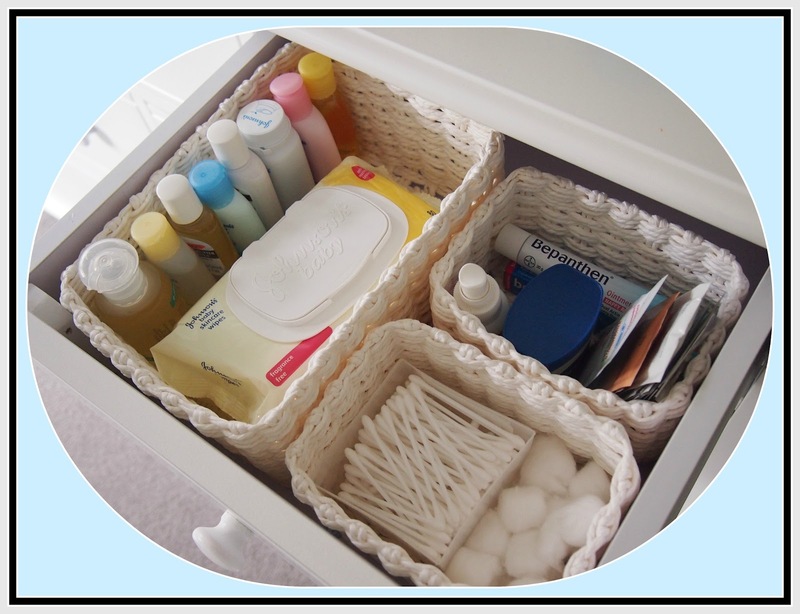 These are a really inexpensive way to keep your drawers organised and neat and small items separated. 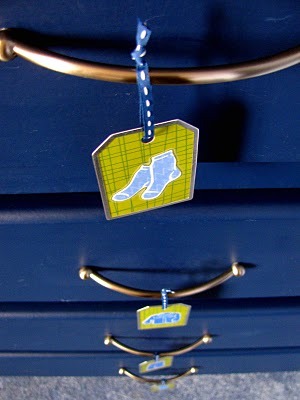 I love the below idea, again from the fabulous Jen at I Heart Organizing, to design some tags so that you know exactly what is located in each of your drawers. For something so small, babies sure need a lot of 'things' - swaddles, blankets, towels, bibs, toys - do I go on?! For ease of use, I have opted to have everything set up in the nursery, as I prefer the idea of keeping everything together including linen for the nursery. The top of the wardrobe has been filled with these amazing storage boxes from Home Storage & Living. The style that I have used is from the the 'Linear' basket range and they are the perfect size to store sheets, towels, extra nappies and blankets. The labels featured throughout my nursery have been designed by yours truly to fit the colour scheme of the nursery. One of the many things I have learnt about babies is that they grow of of clothes - super fast. 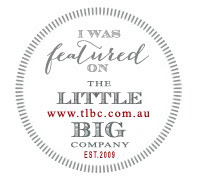 It can be a bit teary to do, but once your little one grows out of a particular item or a range of sizes you need to start thinking about what you are going to do - stash, sell or pass on to friends or family. If you are planning on another baby, then you might want to look at packing these away for number #2, #3, #4 or #5!. I use these simple and cheap plastic tubs from K-Mart which are labelled with what is being packed in the tub and then stored in our garage. That way if we are fortunate to have another baby down the track, I can take in the tubs one by one for use. Another great idea if you are short on storage space is vacuum sealed bags which are labelled. Labelling and sorting these in to categories is the key, it will make things so much easier down the track. I keep the tub at the bottom of the wardrobe and add to it as we grow out of an item. For the most part, the majority of your play with your beautiful bundle of joy will probably be outside of the nursery for now, so you might not need nursery toy storage as yet. At the moment we have a cube storage unit set up in our lounge area which is where we do the majority of our playtime, you can read about the cube unit here. We do however have a small selection of toys and books that we keep in the nursery for bedtime. These are housed with a few other items on a cheap bookshelf in the closest. The bookshelf has been lined with the Ikea Skubb organisers and each has been labelled to easily show the contents. Well not you literally, but your nursery space!! Your needs are going to quickly change over time and in the blink of an eye your baby will become a toddler with very different organisational needs. Don't you wish they could stay this small? Mr B is 2 days old and just slightly bigger than a washer! Well that wraps up Project Nursery, I truly hope that readers planning a nursery will have gained some ideas and inspiration from this series. I sincerely wish you all the very best with your planning and preparation and if I can answer any of your questions, please contact me. If you are in Melbourne and would love some help setting up a beautiful and organised nursery space, please get in touch as I would love to work with you to ensure that when your bambino arrives, you will be set up in the most organised fashion! Don't forget that the Mor-Stor giveaway ends tonight so head on over now and enter for a chance to win the gorgeous Pippa set. As my pictures will attest, this is a 'must have' piece for any nursery or kids room. What is your best nursery organisation tip? I would love to hear your thoughts! 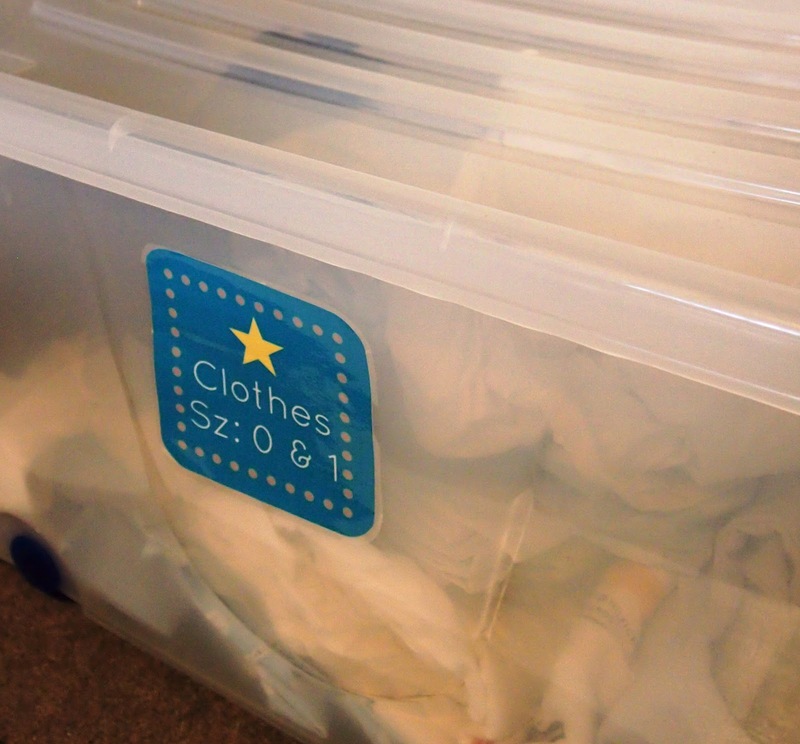 I love the idea Jen had with making the dividers for the kids clothes with labels!! 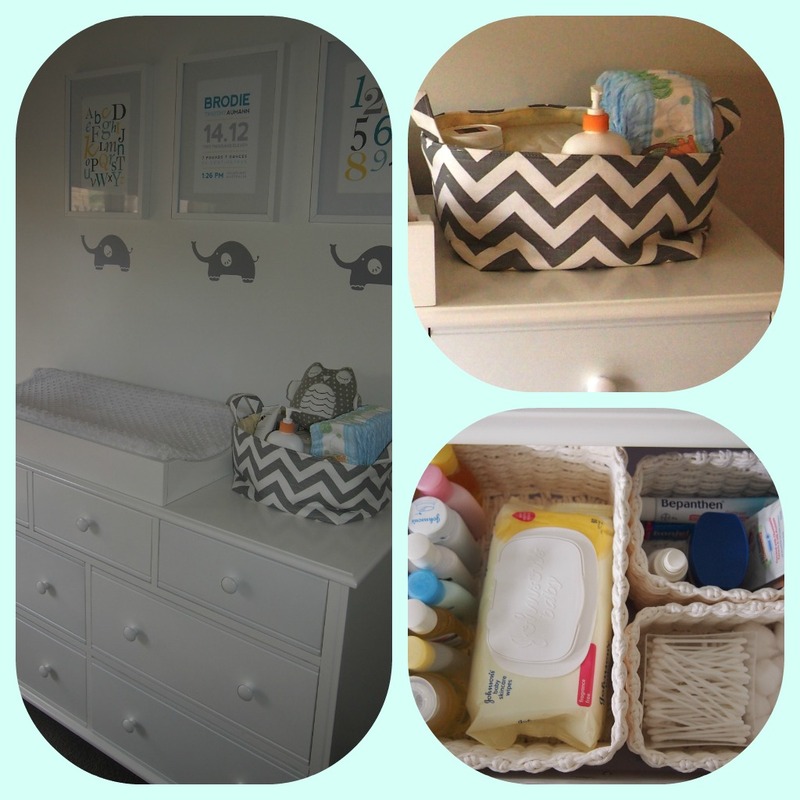 Absolutely LOVE your chevron caddy - I want one too!! I love the dividers too, so I'll make a project of it and post them up if you like? I'll track down the details of the Chevron Caddy and post it for you if you like too? Allison it is just divine! Can I ask for the link as to where you bought Mr. B's prints? They're lovely! They are all through different suppliers - was there one in particular that you were after? Please email me at utterlyorganised@gmail.com and I can shoot you across some details.